I follow a fair few blogger sites across various Social Media Platforms. Recently I came across a post about Being More Funny, and injecting some humour into your posts. Why? Well, because I was surfing the web and I came across it. Because it’s fun to make others laugh and it’s fun to laugh too! The post was by Susan Maccarelli on BlogHer. Susan also writes at Pecked to Death by Chickens. I am not a deliberately funny person. But I thought I’d give it a go. The prompts anyway. The funny will be a work in progress! There are a few that I probably won’t do. Like, #5 If __________ were Kardashians. Because. You know. Kardashians…. I mainly haven’t a clue who most of them are! And #15 The Story of how you lost your temper. Because it would be story after story and it gets boring after a while. Then there’s #16 Kids Quotes. Emma is one. The funniest thing she’s ever done is say to the ringing phone/doorbells “who’s dat?!”. A very short post indeed! But some of the rest I will definitely have a crack at. #3 What’s in your bag. A photo blog! #4 Weirdest things you’ve found on your person. #8 Giving birth saga – especially apt as Emma’s 1st birthday draws near and I still haven’t shared my birth story. Part of it may have to be a video clip. Although it could potentially be construed as offensive? So maybe not! #22 A list of rules for your children to follow in public places, because education is important to young minds! The creative juices are flowing! Apparently I’ve been nominated to win a blogger award. Um. Speechless. Me? 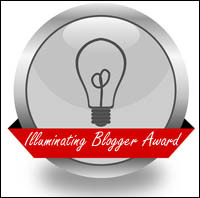 a Nominee for a blogger award. who’s have thought it?!? Thanks CJ at Food Stories for nominating me. still speechless!! It seems nominations are still open, so you too can nominate someone to win this award.